This project is all about a Telnet server I started to write. Using a 'Telnet Client' you can establish a connection to the server. 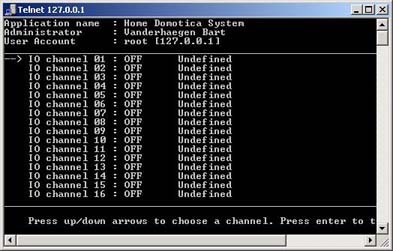 It basically offers you a remote 'DOS' window with functions to control your card over a network or even the Internet. Actually I never finished the software but you can download a working prototype. Please feel free to use or modify the source code! The image shows a screenshot of a Telnet Session to this server. The used Telnet client is the one that comes with Windows. You can use the arrow keys to select a certain I/O channel. By pressing ENTER you toggles its state (ON/OFF). Connecting to a Telnet server requires a client program. One is shipped with Windows but on some editions it is not enabled by default. Under Windows 7 you need to activate the client with the function "Turn Windows features on or off". It is under 'Programs And Features' in the control panel. Once activated you can connect to my server by starting the Telnet client from a DOS prompt. Type: "TELNET 127.0.0.1". (Replace the IP address by your own IP or leave it if the server runs on your own computer). There are more advanced Telnet clients like Putty. You can download Putty from http://www.chiark.greenend.org.uk/~sgtatham/putty/download.html [External]. Download the Visual Basic 5 project files.